Every now and then, I have seen the topic arise on the boards, and never really seen the full scope of this strange occurrence checked, To see who wide spread; what species, and what areas are Effected, A recent thread made by one of my over seas counter parts Did a small bit of elaboration to this strange occurrence when some of his/her specimens passed away. He/she had the opportunity to dissect his specimens and was able to locate a few odd Black masses that had developed within the abdominal space of the tarantula itself. I was hoping we as a community to band together as we have in DKS to help solve this ailment. 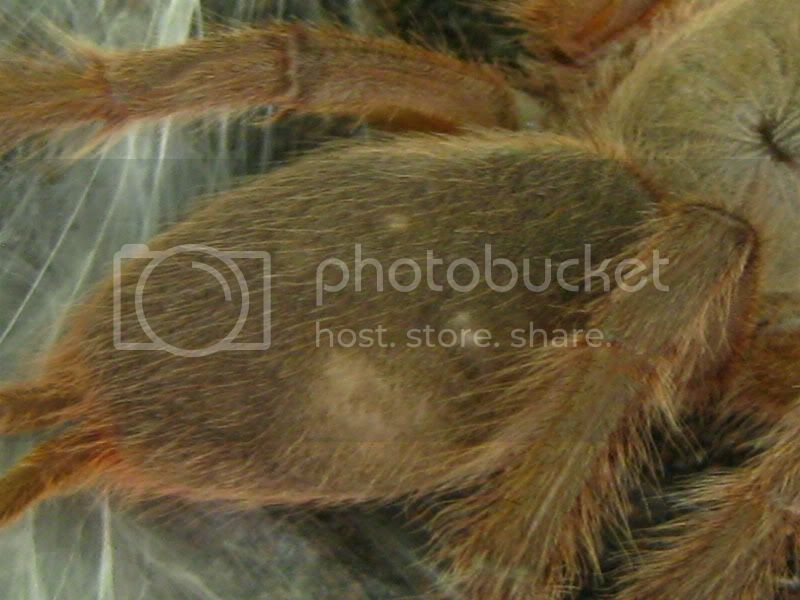 I ask that those with information or groups who are preforming studies to place ways of contact here; and keepers who hae tarantulas with such defects as cysts, to post a quick survey about the affected spider. and any treatment used/ to what effect. 27 February 2011 noted small pink lesion on dorsal pedicle. Enlarged photograph revealed what may have been a small dot of hemolymph leakage. No other leakage aboserved. Patient expired on 5 March 2011, 10 months after started refusing food, 3 months after 'ventrum pressing' first noted, 9 days after small dorsal pedicle lesion first noted. 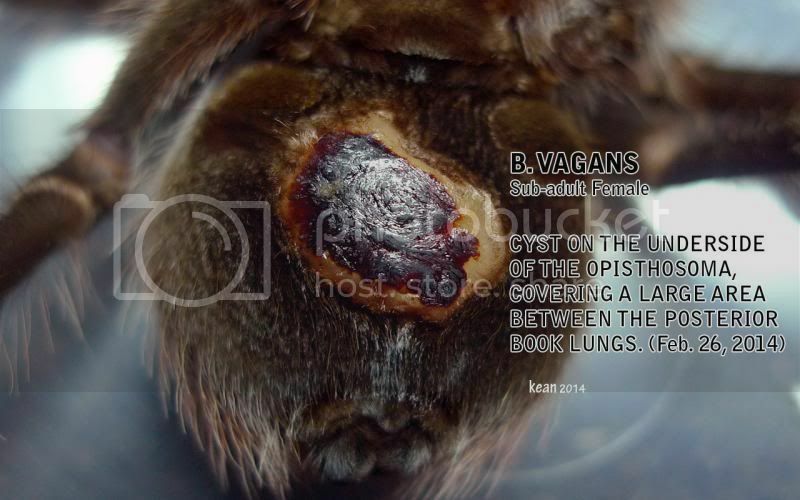 Post mortem: large fluid filled 'cyst' on ventral opisthosoma at pedicle. Necropsy revealed predominantly normal internal organs with occasional black granular 'specks' throughout abdominal contents. At last molt on 24 January 2012 - small raised pink/gray lesion on dorsal opisthosoma just caudal to pedicle. Lesion appears to be at top most abnormal bulbous area on dorsal abdomen - neither was apparent prior to last molt. Four siblings were in my care until recently. One sibling now with another keeper. No symptoms in siblings as of this writing. Patient was rehoused on 11 February 2012 to afford her much needed larger quarters. A medium cricket was offered on 12 February 2012 which she refused. Other than refusing food, she has displayed normal behavior and posture since last molt. 7) If it recovered, did it ever show signs of another occurrence of Cyst/lesion/growth? 10) Prior to the specimen displaying any signs of il health, was there any major changes to its environment/spider room/care? I bought it in September at a reputable exotics shop, so yes. It had been bought and returned by another customer shortly before I got it and its history before that was unknown. I did not see a cyst at the time I bought it. 11) Where there any pesticides spray in or around your home? My landlord may have sprayed pesticides close to his home, about 40 feet from my place. 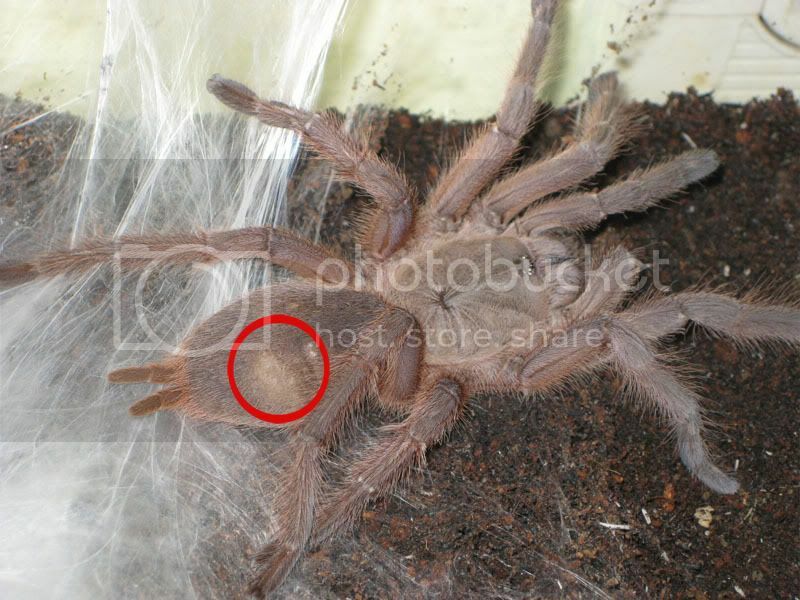 She molted on 10/17/2012 and the cyst appeared larger and fresher. It was dry and red before and now it looks wet and whitish. 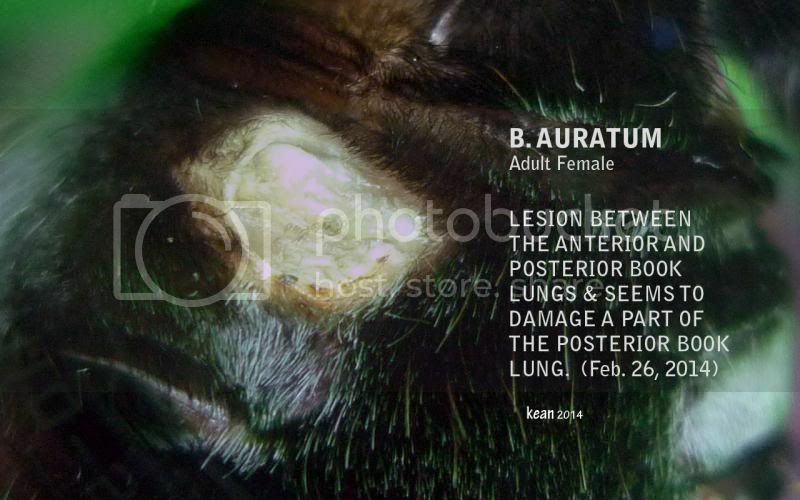 It is on the underside of her abdomen, close or on top of her right book lung. I am hesitant about taking her out for a closer examination so I will wait until she climbs on the side of the cage. 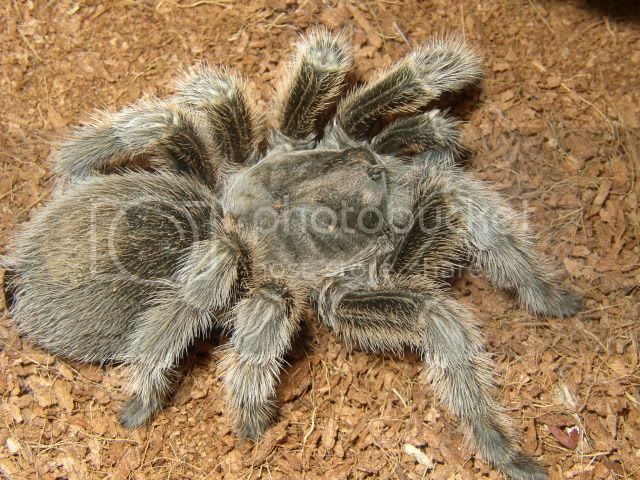 The tarantula behaves as a healthy tarantula would. Sorry when I saw a "cyst" on one of my t's it was a very long time ago, as a result I have no data. It was a white dot on its abdomen. It didn't really grow but during a molt my T died. I never really thought it could have been the 'cysts" fault until now. 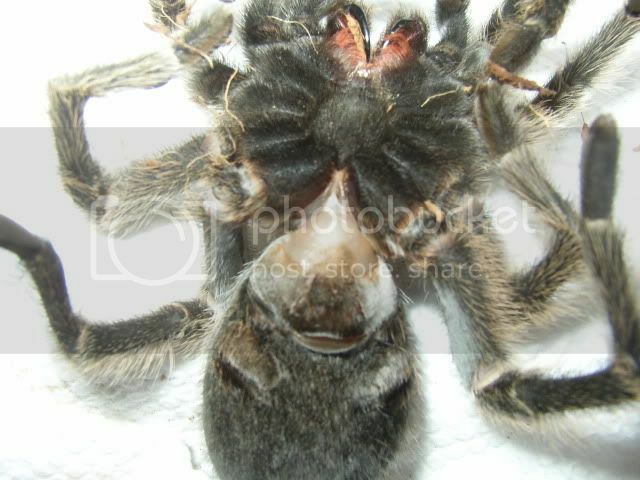 This spider was kept on meager rations (one medium sized prey item per month) and molted again on 6 June 2012. The cyst was still present, but noticeably smaller. 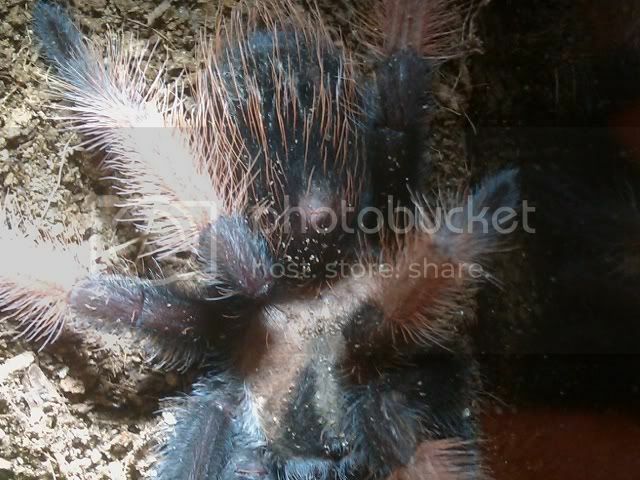 I continued to feed her sparingly and she molted again on 18 April 2013, with no cyst apparent! 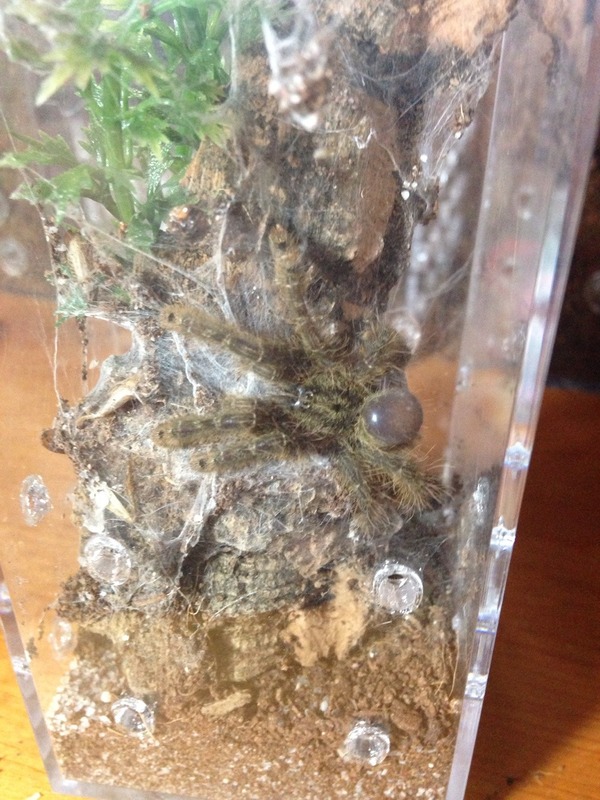 well this was from a long time ago so i'll try to remember..
13) If the specimen recovered, please provide info on how the care regimen was changed or what was done to aid recoverI just kept her in the same environment, same enclosure and same feeders until she molted. Well, after molting out from the cyst she molted one more time before dying. Probable cause of death is Dehydration. 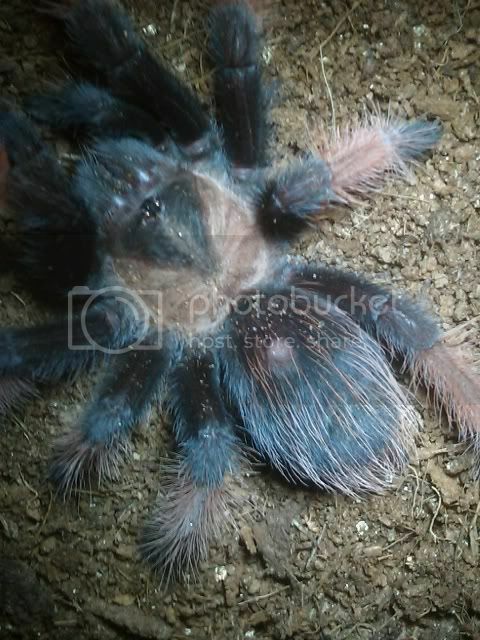 Grammostola Rosea, 5" Female, had a previous owner, i got her cyst-free. After her previous molt i discovered a very small disfigurment on her abdomen (internal not external) and it was like that for over 2 years. She molted this week and during molt this cyst opened causing leakage. Specimen is still in ICU, 30 hours after bleeding began. Will post pics in both cases. This is 2 days after the molt. cyst looks scabbed and Rosea is active. I will update this after i see improvement or impairment. Psalmopoeous Irminia, CB, acquired at about 1", turned out to be male. Developed a small cyst on the sternum plate at the 2" molt. Ate and drank as normal, and molted out of it successfully on the following molt. Care regimen wasn't changed but the tarantula was moved into a new enclosure. He built his burrow in the corner around the water dish, and the result was it was trapping moisture in the soil below it, eventually resulting in visible mold or fungal formation in the soil, and his immediate rehousing. The cyst appeared in the molt right before that move. I found a PNAS journal that discusses the vital role of enzymes and proteins during the molting process. It is a good read, it mostly discusses insects molting, but it later says that this process is shared by all inverts with chitinous exoskeletons. "During each molting cycle of insect development, synthesis of new cuticle occurs concurrently with the partial degradation of the overlying old exoskeleton. Protection of the newly synthesized cuticle from molting fluid enzymes has long been attributed to the presence of an impermeable envelope layer that was thought to serve as a physical barrier, preventing molting fluid enzymes from accessing the new cuticle and thereby ensuring selective degradation of only the old one. In this study, using the red flour beetle, Tribolium castaneum, as a model insect species, we show that an entirely different and unexpected mechanism accounts for the selective action of chitinases and possibly other molting enzymes. The molting fluid enzyme chitinase, which degrades the matrix polysaccharide chitin, is not excluded from the newly synthesized cuticle as previously assumed. Instead, the new cuticle is protected from chitinase action by the T. castaneum Knickkopf (TcKnk) protein. TcKnk colocalizes with chitin in the new cuticle and organizes it into laminae. Down-regulation of TcKnk results in chitinase-dependent loss of chitin, severe molting defects, and lethality at all developmental stages. The conservation of Knickkopf across insect, crustacean, and nematode taxa suggests that its critical roles in the laminar ordering and protection of exoskeletal chitin may be common to all chitinous invertebrates." In my opinion, this could offer insight to what is going on during the growing and molting phase and may suggest that these "defects" we are seeing in our T's is due to some type of protein and/or enzyme imbalance. If anybody cares to read through this and offer a more educated guess please do. I am not an expert, I am merely going off the results that are available. Follow-up: Recovered specimen P. irminia reached maturity (MM) with no further incident. Currently on a dating excursion. 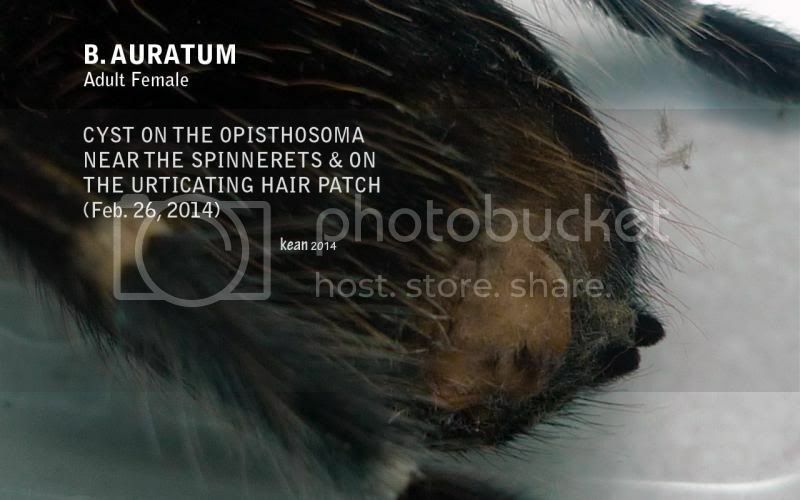 just noticed it today, she molted at around Sept. or Oct. 2013 with a part of the old exuvium sticking to her opisthosoma where the cyst is visible, I tried to remove the old exuvium and it came off upon pulling but leaving a bald patch on it (no cyst yet). then when i visited today i noticed the cyst growth on it and a lesion underneath the opisthosoma (see pics). 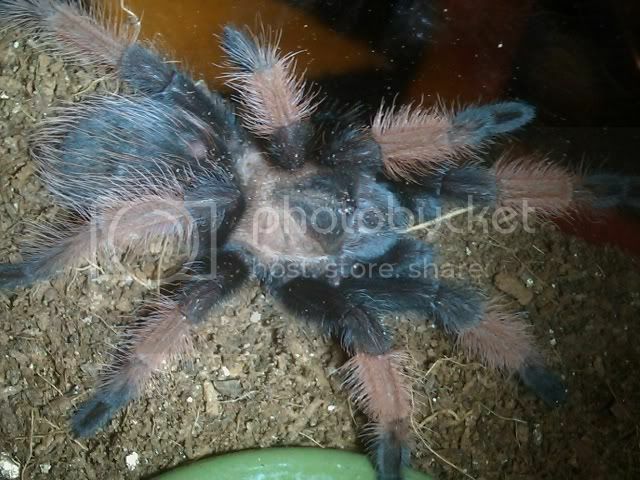 I did not notice the lesion until today so I have no idea if she had it when she molted or got it sometime in between. N/A (I do hope so) She's still very active kicking hairs when i packed her up to transfer her here with me. The times I visited since she molted, she's active and kills and eats prey normally. So I'm hoping she just molts out of it and be fine. and I will update if anything happens. just noticed it today, she molted at around June or July 2013, After molting I noticed a small bald spot on the underside of her opisthosoma. I was already thiking it was a small cyst, and to my surprise it got bigger and formed a dark spot on it (see pic), and it seems hard, is I hear it bump on the transfer cup during packing. The Opisthosoma also looks more round (top view) than usual (cannot be seen on photos). N/A (I do hope so) She's still very active and has kicked hairs when i packed her up to transfer her here with me. Currentlyshe is hanging around the water dish and I saw her taking sips on it. UPDATE: #8. 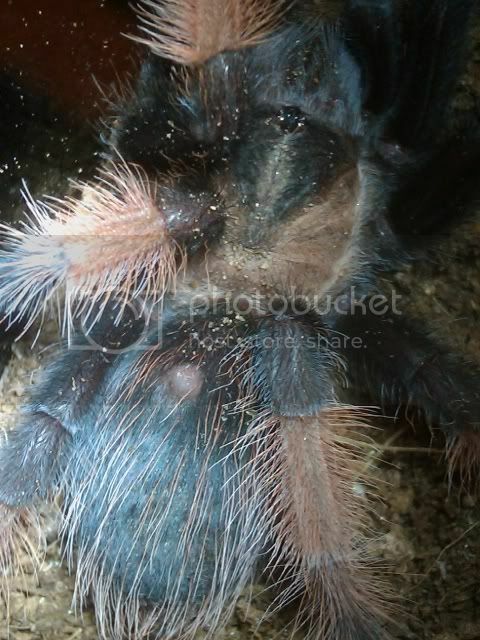 Tarantula sadly died about one month after the cyst opened due to a molt. She was getting weaker and weaker until she passed away. Specimen- B. smithi sling around 1.75"
3) Was a clean water bowl available at all times? Distilled water, have yet to feed as I received the spider in premolt. It molted yesterday and I noticed it today. Seems fine at the moment. It was shipped to me from a dealer a week prior. It's under 2" so no water bowl is present. I am watching it closely for changes. In my opinion, the outlook is bleak. 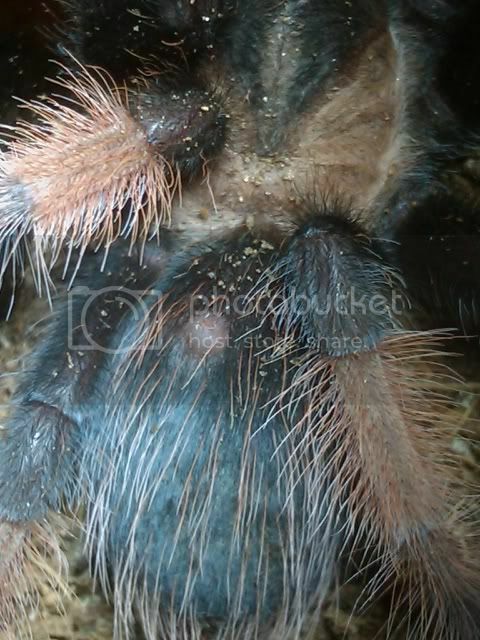 A little after I got the GBB in a trade I noticed a small cyst on its abdomen around the top close to the carapace. I guess that would be around August of last year. Not in my care but as stated it was traded for so it did change rooms/homes. After researching other cases of cysts I noticed every single person sparingly fed and for the most part the cyst would persist and in some cases would get over it in the long run. The cyst on my GBB was very pretty small in comparison and I went against the sparingly feed tactic and power feed it. Before I get reemed for it the cyst did pop and only a tiny droplet of fluid came out and closed that night. Next molt the cyst was a tiny dot of a scar and one more molt after it was gone. I was ready to seal the wound if I needed to but I never had to. This GBB has had no other problems and is a little speedy demon. Im not saying it will help most as I have seem some pretty bad cysts and they are not always in a spot that this strategy would be viable at all but I would say if you catch it very early and its not in a vital spot this may work. Also this is the only cyst I have had caring for T's so take that for what it is as well, Maybe I just got lucky. I just lost my darling Euathlus sp.red AF to a cyst I didn't even know she had. Here's my report. Usually fed on small dubia nymphs, which I raise myself, but was fed a somewhat small superworm bought at Petsmart a week or so prior to death. The dubia are given a wide range of organic fruit and veggies; the worm was given organic veggies prior to being used as a feeder. The physical cyst was not discovered until we inspected her after she'd been found dead. She had been acting off a few weeks prior (a Euathlus sp.red not climbing about or digging is a bit odd) but had eaten, though slowly, so I had thought nothing of it. The night before her death I noticed what looked like a mild death curl and put her in an ICU thinking she was somehow dehydrated, but had foolishly not checked her for any signs of injury and after acting normal in the ICU for several hours, put her back in her enclosure. She was discovered already dead, in a death curl late this afternoon and it was clear from her lack of stiffness she had only recently passed. After inspecting her, it appeared that the cyst had ruptured; cyst was located slightly off center on her pedicel.I was not able to get a picture before we wrapped and freezed her, but the ruptured area was milky white and tinged yellow around the edges. Not that I'm aware of but there has been work on the apartment upstairs and we've seen particles fall out of our vent while they work so it's entirely possible that anything used up there could have filtered down here. However, she was displaying unusual behavior before this work began (which only started a few days ago). My mother-in-law also moved in around the time she began to act odd and frequently douses herself in perfume in the bathroom and then walks right past my outlying tarantulas (one of whom was this Euathlus female), leaving a huge wave of nose-burning chemical smell in her wake, despite my repeatedly making a big deal about it (I have allergies so it bothers me too). 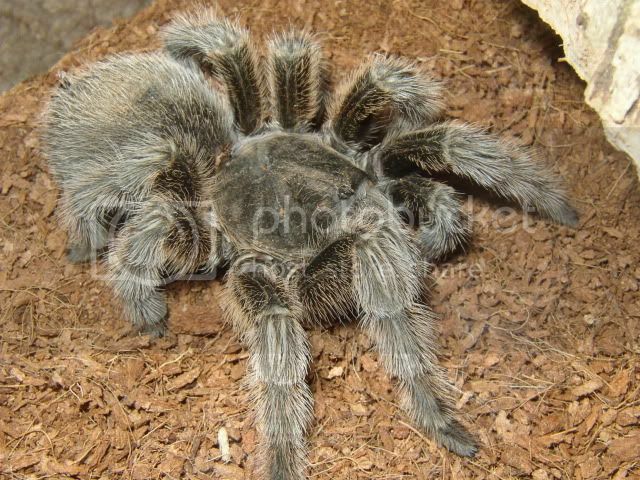 I'm not sure about the effects of the chemical concoctions that is perfume on tarantulas so I'm not sure how relevant it is, but it's the only chemical I can think that she may have been exposed to. My guess as to what happened? The hard cork she had the opportunity to walk on could have either caused or worsened an existing cyst. Being fed a superworm with said cyst may have put pressure on it and eventually, caused it to rupture. Had I known she had a cyst, I certainly would not have fed her such a big meal. Definitely an awful way to learn a lesson about inspecting your Ts. I'd really appreciate opinions/comments/suggestions on this. I am keeping the T in a small quarantine tank out of my T room and I'd really like to bring it in with the rest of the collection. It will be getting really cold soon and I won't be able to keep it warm enough where it is currently staying. Any reason to think this is contagious or a danger to my other Ts? Not recovered (at least fully) as of yet. It appeared the B vagans was being kept rather moist at the LPS. I am keeping the substrate on the dry side with water dish available at all times.